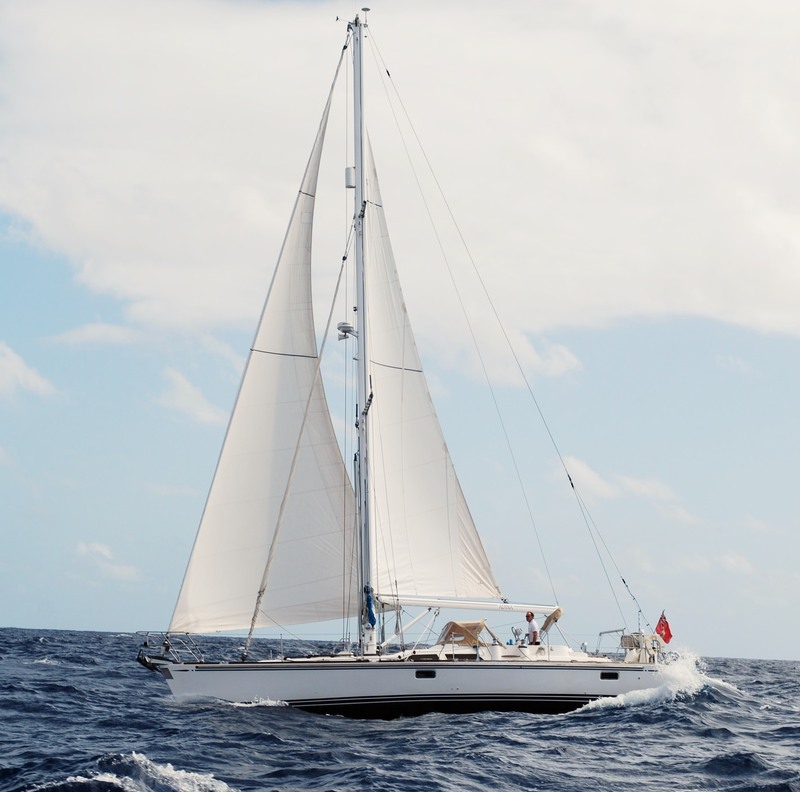 Adina is a Hylas 46 – a fourteen metre blue water cruiser designed to sail around the world. And she’s our home! Adina has a large cabin (bedroom) located at the stern (back of the boat) with an on-suite shower that delivers a good burst of hot water when needed and electric fresh water flushing heads (toilets). Our guests stay at the front of the boat in their own cabin with a double bed located to one side and cupboard space on the other – and they get an even larger shower and toilet than we have! We now warn guests before they use the toilets as they are just like aeroplane toilets with a reassuring vacuum flush and they have given one or two people a fright. The galley (kitchen) is a nice size; we have a gas stove and oven and separate large front-and-top-accessed fridge/freezer. A microwave sits there hoping and praying somebody will use it. We see it as a built-in Faraday Cage should we ever get caught in a lightening storm. The saloon (lounge) can sit up to six at a squeeze. One of the sofas doubles up as a single bed if needed. Then there is ‘Tom’s Bar’ – you have to come on board to see this! To complete the set-up is the nerve centre of the boat positioned at the back of the saloon – the navigator’s seat complete with a Simrad NSO navigation plotter, radar, AIS, VHF and SSB radios, Iridium GO! satellite phone and a full bank of switches to control all of the electrics on board. 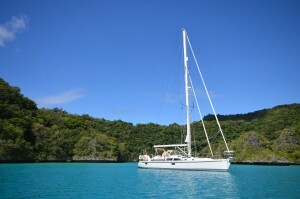 On deck, Adina has a central cockpit which is a preferred option for people sailing open waters to minimise the chance of getting wet. We have a plug-in gas BBQ which we love! Our car is a Lodestar Hypalon inflatable dinghy with a Suzuki 6HP engine. Teak decks burn the feet when it gets hot and need cleaning too often. 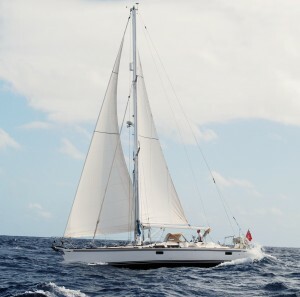 Adina is a cutter rig which in plain English means she has a single mast with main sail and then two forestays on the forward deck for a big overlapping genoa and smaller staysail for windier conditions. Designed to be sailed by a couple, she has electric in mast furling with a vertically battened mainsail. We also have a Parasailor for downwind sailing which is tremendous fun – although getting it down when the wind is up involves some shouting. Steps at the back of Adina with a hot/cold shower means swimming is a must. Other features include a diesel powered generator for when we are away from shore power and a water maker for when we have no access to water from land. All in all, we love our home! hi, great to read about your preparations – how exciting. We have had two folding bikes on board for the past eighteen months and i would be wary about putting them in the anchor locker. Ours are aluminium but there are still some steel parts that corode – even stored in the lazarette. folding bikes are a great idea – we use them everywhere. Ehm ehm…still waiting for the plain English bit…! Hi Miss Cunningham, it’s Dhilan from the upper remove. Just wishing you and your fabulous crew the best of luck out there in the high seas. PS: We hadour first house assembly 2day with mr Hipkiss…loks like you’ve still got a competition on once you return 2 school. This is Alex, Rory, and Ned in the Lower Remove. We just wanted to see how you’re doing and wish you luck for the rest of your journey.